ALEC GUINNESS in "The Bridge On The River Kwai", Marlon Brando in "Sayonara", Anthony Franciosa in "A Hatful of Rain", Charles Laughton in "Witness for the Prosecution", Anthony Quinn in "Wild Is the Wind"
JOANNE WOODWARD in "The Three Faces of Eve", Deborah Kerr in "Heaven Knows, Mr. Allison", Anna Magnani in "Wild is the Wind", Elizabeth Taylor in "Raintree County", Lana Turner in "Peyton Place"
RED BUTTONS in "Sayonara", Vittorio De Sica in "A Farewell to Arms", Sessue Hayakawa in "The Bridge On The River Kwai", Arthur Kennedy in "Peyton Place", Russ Tamblyn in "Peyton Place"
MIYOSHI UMEKI in "Sayonara", Carolyn Jones in "The Bachelor Party", Elsa Lanchester in "Witness for the Prosecution", Hope Lange in "Peyton Place", Diane Varsi in "Peyton Place"
DAVID LEAN for "The Bridge On The River Kwai", Joshua Logan for "Sayonara", Sidney Lumet for "12 Angry Men", Mark Robson for "Peyton Place", Billy Wilder for "Witness for the Prosecution"
This awards ceremony, held on March 26, 1958 and broadcast live, was the first TV production to be produced by the motion picture industry itself. The entire show was broadcast from Hollywood - there were no cut-ins from New York as in the previous five years. The number of competitive categories, which had grown to 30 in the previous year, was now downsized to 24. Unfortunately, the presentations were overshadowed by the recent death (March 22, 1958) four days earlier of the previous year's Best Picture producer/winner Michael Todd, husband of Elizabeth Taylor. And Columbia Pictures' legendary but often-despised boss Harry Cohn, one of the original founders of the studio that produced the Best Picture winner this year, also died a month before the ceremony, on February 27, 1958. 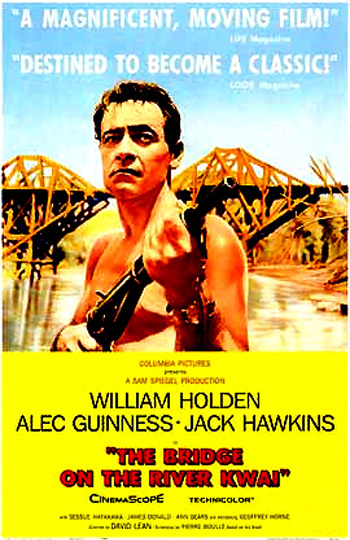 The war-time film centered on a battle of wills between an obsessed and rigid British colonel and a Japanese POW camp commander within a prison camp deep in an Asian jungle - with the theme of the folly of war. [Historically, this was the second Best Picture Oscar for a British film.] The Best Director Oscar was David Lean's first Oscar after three previous nominations (Brief Encounter (1946), Great Expectations (1947), and Summertime (1955)), and it was Lean's first sweeping epic picture - the kind of film for which he would became famous. He also became the first British film-maker to ever win Best Director. The only nomination that did not succeed for the film was veteran silent film actor Sessue Hayakawa's Best Supporting Actor nomination as the POW camp commandant Colonel Saito. Alec Guinness (with his second acting nomination out of a career total of four acting nominations) brilliantly played the role of a rigid, stiff-lipped, militarist, humorless British officer Colonel Nicholson, who fought a by-the book, gentleman's war in the Best Picture winner. The unparalleled Guinness had previously been known for his British Ealing comedies including Kind Hearts and Coronets (1949), The Lavender Hill Mob (1952), and The Man in the White Suit (1951). Now he would go on to make similar blockbusters such as Lawrence of Arabia (1962) and Doctor Zhivago (1965).] The Best Actor award was Guinness' sole acting Oscar in his career. Gilbert M. "Broncho Billy" Anderson, famed silent cowboy star, and filmdom's first major Western hero (he briefly appeared in The Great Train Robbery (1903) and other silent westerns), was presented with an Honorary Academy Award as a "motion picture pioneer, for his contributions to the development of motion pictures as entertainment." Platinum blonde actress Lana Turner, with a film career of nearly twenty years in length, received her first and only Oscar nomination in 1957, although she had more exceptional, un-nominated roles in earlier films including The Postman Always Rings Twice (1946) and The Bad and the Beautiful (1952). About ten days after the awards ceremony, on April 4, 1958 (Good Friday), the Best Actress nominee was involved in a notorious Hollywood scandal, in which her 14 year-old daughter Cheryl Crane fatally stabbed Lana's mobster boyfriend Johnny Stompanato while he was beating up her mother in her Beverly Hills home (for not taking him with her to the awards ceremony!). Some rumored that there was a cover-up and/or speculated that Crane and Stompanato had been lovers. The killing was later ruled a justifiable homicide. This event rejuvenated Lana's career more than her Oscar nomination - her next film Imitation of Life (1959) was a hit. And actress Elsa Lanchester, wife of Charles Laughton, received her second and last Best Supporting Actress nomination in 1957 (her only other nomination was for Come to the Stable (1949)) as co-star Laughton's nurse in Witness for the Prosecution, but she had more memorable, unnominated performances during her career, including her role as Anne of Cleves in The Private Life of Henry VIII (1932-33) and the title role as the Bride in Bride of Frankenstein (1935). Marlene Dietrich deserved a nomination for her role as the murder suspect's wife Christine Helm/Vole (and in a second role as a mysterious Cockney-accented woman) in the plot-twisting Witness for the Prosecution. None of the actors in the jury in Sidney Lumet's 12 Angry Men (Henry Fonda as Mr. Davis (liberal, stoic and compassionate Juror No. 8), E.G. 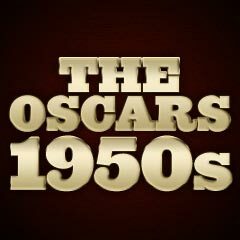 Marshall, Ed Begley, or Lee J. Cobb) received an acting Oscar nomination. And William Holden was neglected in the oft-nominated Best Picture winner The Bridge On The River Kwai as American POW Shears. Stanley Donen's Funny Face, a delightful musical romantic comedy with Fred Astaire, Audrey Hepburn, and Gershwin tunes, received only four minor nominations (and didn't win any of them): Best Art Direction, Best Cinematography, Best Costume Design (Edith Head), and Best Original Screenplay. The Best Original Screenplay award was undeservedly presented to George Wells for Designing Woman, when it should have been given instead to either Federico Fellini (and fellow authors Ennio Flaiano and Tullio Pinelli) for their Best Foreign Language film winner Nights of Cabiria, or to un-nominated director/screenwriter Ingmar Bergman for The Seventh Seal. Toshiro Mifune was snubbed for his performance (with his memorable death scene from archers' arrows) as increasingly-insane, ruthless feudal lord General Taketori Washizu, as was Isuzu Yamada's Noh-influenced Lady Macbeth role as his wife Lady Asaji, in Akira Kurosawa's Throne of Blood (Jp. ), an adaptation of William Shakespeare's Macbeth, and released in the US in 1961.